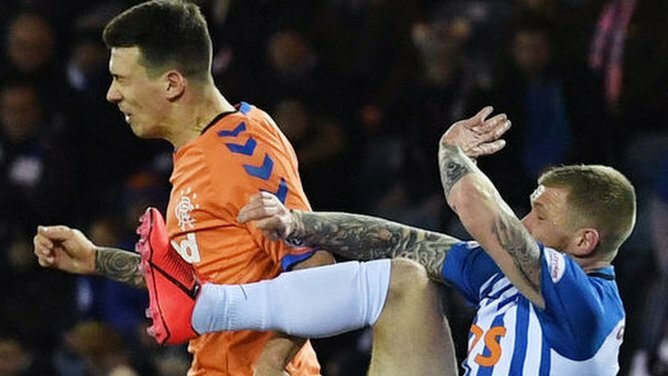 Kilmarnock’s Alan Power and St Mirren captain Paul McGinn will both face no action after high-profile collisions in Saturday’s Scottish Cup fixtures. Midfielder Power was booked by referee Alan Muir in the 0-0 draw with Rangers for a high boot on Ryan Jack. McGinn was also cautioned for an elbow to the face of Cammy Smith during his side’s defeat by Dundee United. However, there was not enough evidence for the compliance officer to raise a fast-track notice of complaint. Should McGinn have been red carded? Rangers boss Steven Gerrard said he would be “interested” to see if retrospective action was taken against Power. The Glasgow club failed to overturn a three-game ban given to striker Alfredo Morelos, who was sent off in his side’s win over Aberdeen last Wednesday. They have successfully requested a 24-hour delay to Allan McGregor’s disciplinary hearing, which will now take place on Wednesday, with the goalkeeper facing a two-match suspension for an incident in the same fixture.